Julens Tolv Dage - Doreen and Lars Bo 1953 - O.C. 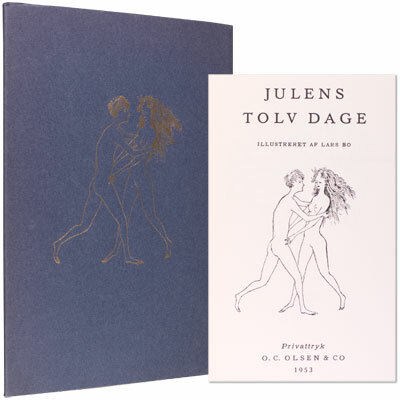 Olsen & Co, Denmark	One of 850 copies privately printed for Doreen and Lars Bo to give to friends. A fine copy, of this personal interpretation in Danish of the traditional carol ‘The Twelve Days of Christmas’, written and beautifully illustrated by renowned Danish artist and illustrator Lars Bo, with gilt illustrated blue paper wrappers, and inscribed from Doreen and Lars Bo to their friends the equally renowned illustrator Ronald Searle and his wife, the journalist and publisher Kaye Webb. Lars Bo (May 29, 1924 – October 21, 1999) was a Danish artist and writer. He is known for his graphic works with surrealistically inspired fantastic motifs. He was nicknamed "Wizard". Bo worked with P. Rostrup Bøyesen at Statens Museum for Kunst in the period from 1939 to 1940, and he went to The Danish Design School from 1941 to 1943, after which he travelled and worked in Europe. From 1947 until his death in 1999 he lived in Paris. From 1948 to 1950 Lars Bo worked in Johnny Friedläender and Albert Flocon’s graphic studio in Paris. H e also wrote the novel Det vidunderlige hus i Paris (The Wonderful House in Paris). In the early 1950s to study art and printmaking techniques at the famous Atelier 17 in Paris, under the directorship of Stanley William Hayter. Bo began exhibiting his individual prints and paintings in Paris in 1954. Shortly thereafter he became a leading artist for the French periodical, Le Monde. Bo also had a long and successful career as an illustrator, he produced etchings and aquatints for many classic illustrated books, some of his greatest works were for editions of Hans Christian Andersen. By 1960 Bo had established an international reputation (especially for his original prints) and exhibitions of his art were held in England, the United States and Japan.